Located just outside of Snowflake on 20 fully fenced acres. 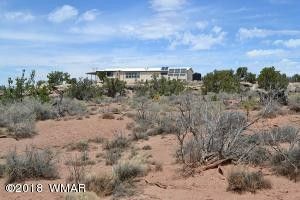 House sits atop a hill & has incredible panoramic views of the Valley to the N, S and W - close to State land. Nicely laid out home with spacious kitchen with view windows to the West, large dining area & split bedrooms. Arizona room is a bonus. Natural boulders create your deck off the rear of the home. Large attached garage, concrete paths, & gravel around the house are all additional features. Pressure tank, 16 new batteries for the solar system, 3, 000 gallon storage tank, back up generator. Seller has created a walking/bike trail around the 20 acres. Approx. 7 miles from Snowflake, varied dirt roads, but close to town. Well maintained off grid home, ready to move into. The Sunsets are awaiting! Priced under recent appraisal. Directions: From Concho Highway head East on Concho Highway 2.2 miles to Snowflake Heights, follow accross cattle guard, left at the fork, follow to end of Snowflake Hieghts and veer left at the San Carlos sign (Antelope Ridge) Right on Clyde .5 mile to Left on Justin, 2 miles to house on right. Roads can be rough.